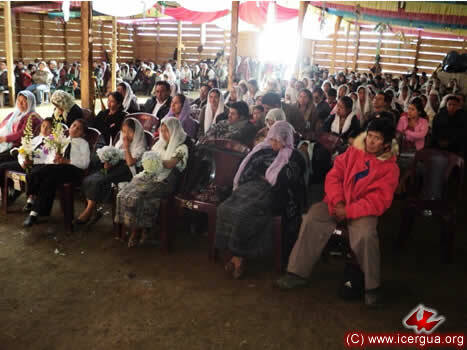 On Friday, April 1, Monsignor Eduardo began his missionary journey by visiting the Chuitzanchaj Community for its monthly Eucharist celebration. As always, the community was eagerly awaiting the bishop’s arrival. 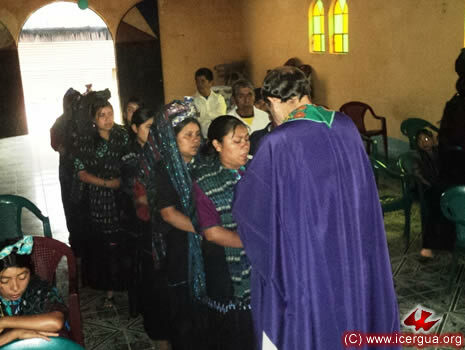 Like many other communities, this one has the practice of requiring a member whose participation has lapsed to go through a period of prayer and penitence, before he is fully reunited with the community. 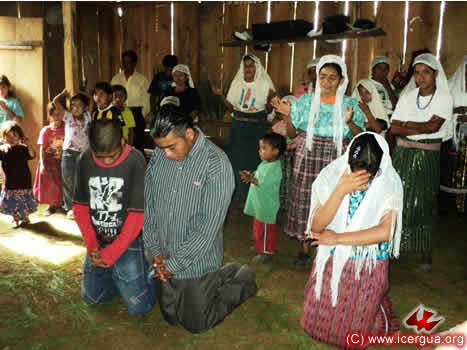 During this visit, a young man named Miguel, who had completed the period of preparation for reincorporation into the community, made his “reconciliation,” so that now he can fully participate in the life and ministries of the community. Above: Some of the participants praying for the young man who had been reunited with the community. Right: Some of the participants coming forward to receive Holy Communion. 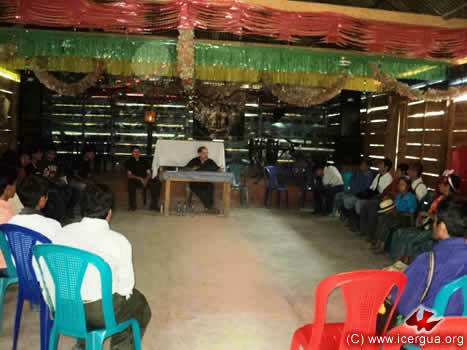 At dusk on April first, our bishop visited the Pajomel Community. He exhorted the participants to live during Lent in the authentic spirit of Renewed Catholics in prayer and fasting in order to be able to grasp and be grasped by the full meaning of the mysteries of Easter. 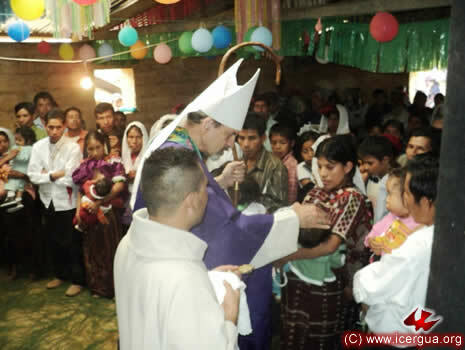 Right: The bishop distributing communion to those who had been prepared to receive it. 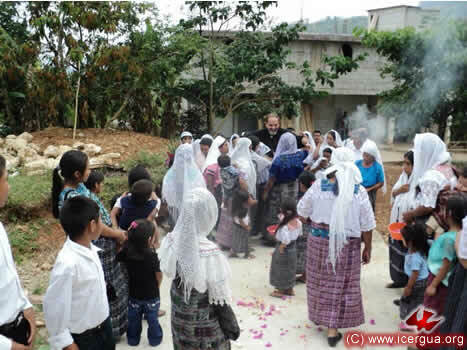 On Saturday, April 2, Monsignor Eduardo made his second visit to the new community in Todos Santos Cuchumatanes. 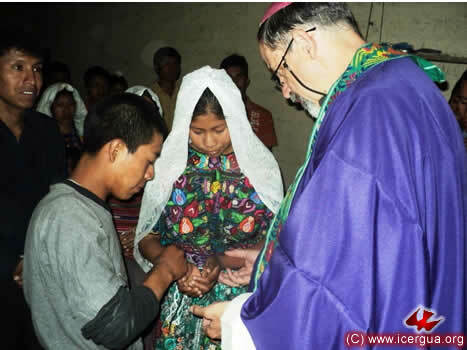 In addition to celebrating Eucharist, the bishop administered the sacraments of Christian Initiation to three children and the sacrament of marriage to two couples. Right: After the exchange of consent, Pedro and Margarita exchange rings, sign of their everlasting love and faithfulness. 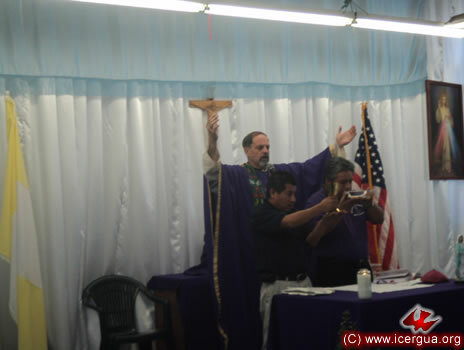 Left: The two Communion Ministers present the community’s offering, over which the bishop then invokes the outpouring of the Holy Spirit so that it may be the consecrated Body and Blood of Christ. 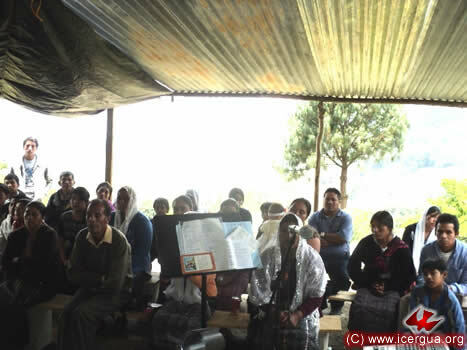 During the visit at Todos Santos, some faithful from Malacatancito, Huehuetenango, came to request that they be joined to the Church. 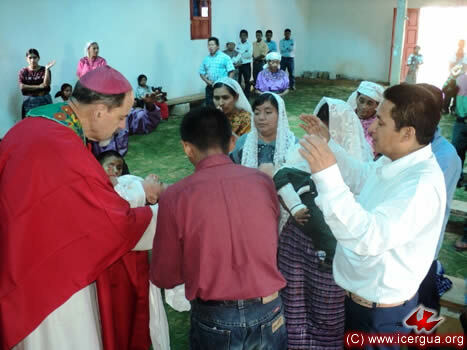 After studying the request, the bishop agreed to it, gave them catechetical materials on preparaing to receive the various sacraments. It was agreed that in a timely manner the formal recognition of the new community’s covenant with and entrance into ICERGUA would take place. 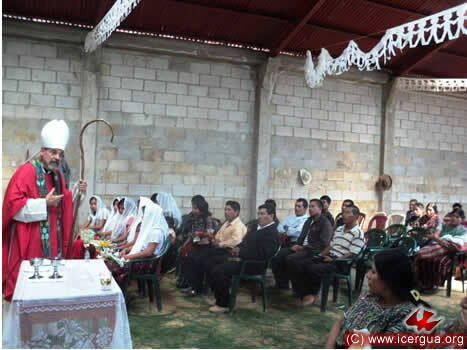 During the afternoon of Saturday, April 2, the bishop made his first visit to the Siete Cerros Community, located in the municipality of San Pedro Necta. 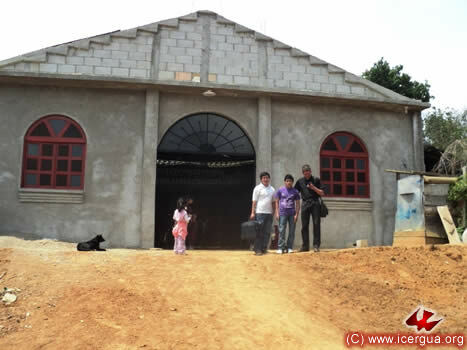 This community made its covenant only a few months ago and has already put up the walls and roof of its new house of prayer, and at the same time has made a serious effort to grow spiritually. 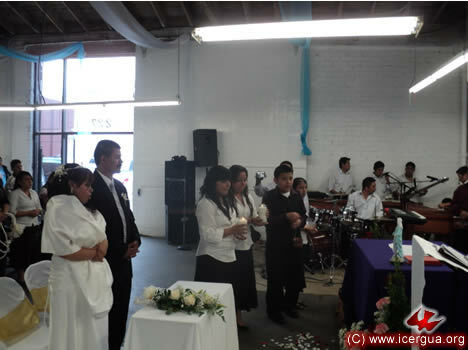 During the visit, nine faithful were initiated into Christian life and six couples celebrated sacramental marriage. The celebration began with the Liturgy of Reconciliation. The faithful, duly prepared, confessed their sins and then received Absolution. Right: After the confession of sins the Holy Spirit was invoked before Absolution was received. 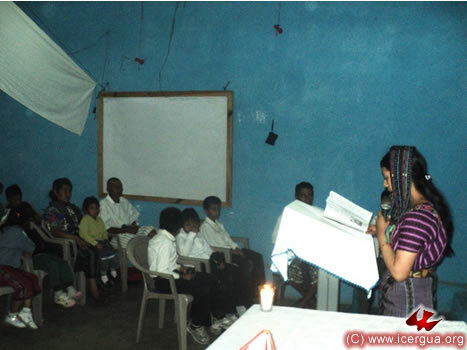 Among those who were initiated into Christian life was Verónica, in the photograph at left. 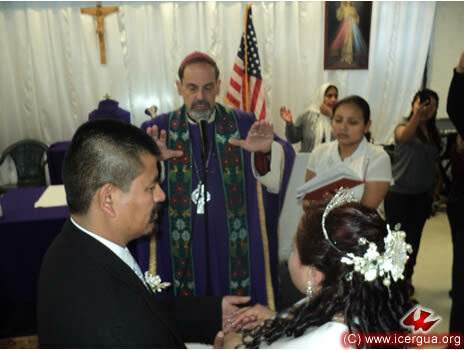 In addition to receiving the sacraments of initiation, she celebrated her marriage with Evelio, with whom she had a son, who also received the sacraments of Christian Initiation. Right: The bishop administering the Holy Chrism for those who had just been baptized. 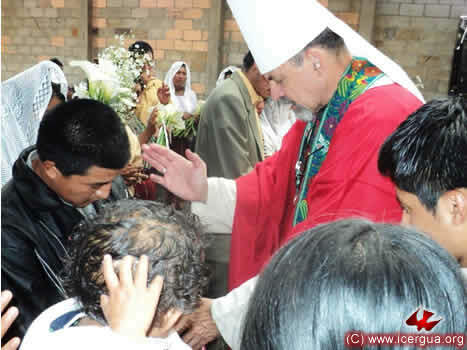 Assisting the bishop is seminarian Yaider Jiménez, who is doing his supervised field work (EPS) here and who had been responsible for preparing so well those who received the sacraments. 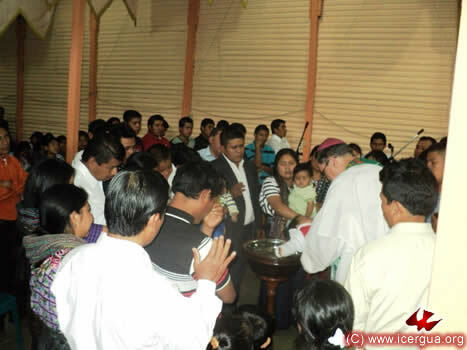 On Sunday morning the bishop celebrated Eucharist for the first time with the nascent community of “Efusión del Espíritu Santo” in Zone 3 of Huehuetenango. 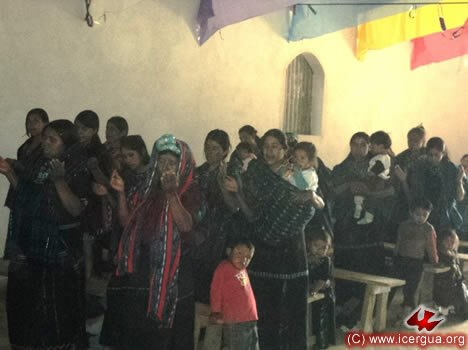 This community has been accompanied in its formative stages by the faithful of the San Antonio Las Nuebes Community of Chiantla, especially brothers León and Regino. 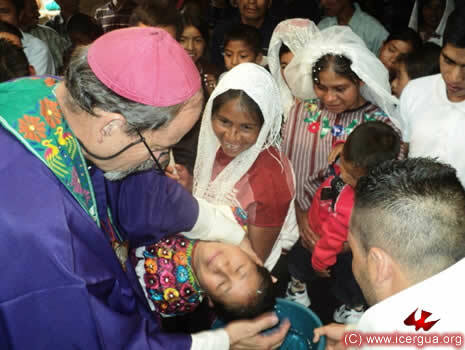 During the visit, a child received the sacraments of Christian Initiation. The community has experienced stiff persecution from various religious groups. Nevertheless, the faithful are strong and eager to continue carrying out the mission they have received. 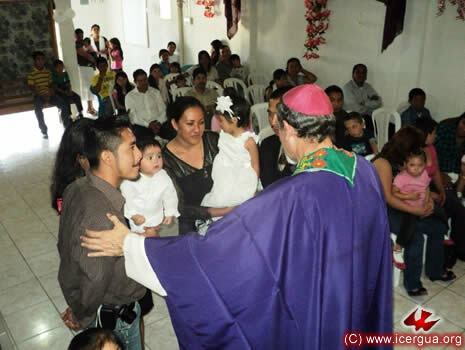 Above: The bishop exhorts the parents and sponsors of the child who was to be initiated into Christian life to live as good Christians in order to be able to support their son’s Christian growth. Right: The faithful join hands to pray the Our Father. 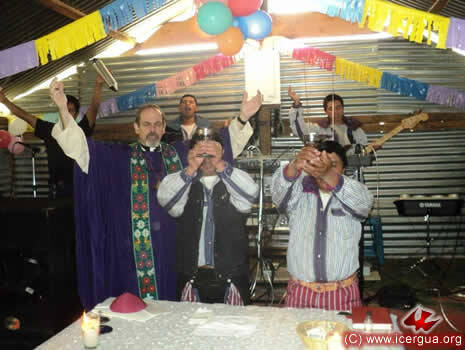 At midday on Sunday, April 3, the bishop celebrated the sacraments of Christian Initiation with two children and the Eucharist with the Brasilia Community, Zone 7, Huehuetenango. 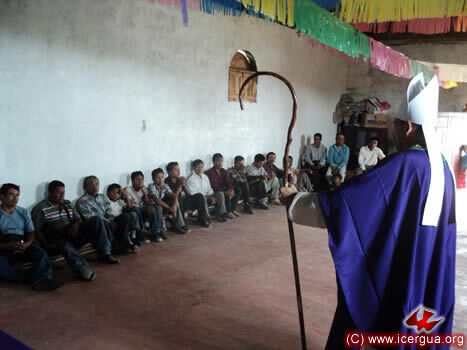 Brother Mynor is the leader of the community and also the coordinator of the Pastoral Council for the municipality of Huehuetenango. 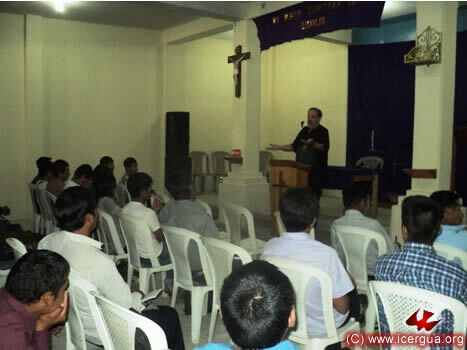 The community has been growing at a steady rate and is eager to continue carrying out its evangelizing mission. 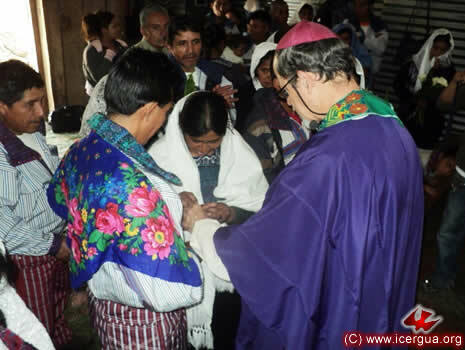 Right: The bishop receives the promise of parents and sponsors to live their Christian calling to the fullest, so they can educate their sons in the faith and witness to the Gospel for them. When our bishop visited California, a dialogue began with the Oriental Orthodox Church, the oldest form of Orthodoxy. The name Catholic Orthodox has been used since the sixth century. Today there are three branches. : (1) the Syrian Patriarchate of Antioch and All the East, whose see was founded by the Apostle Peter, who was its bishop when he was taken to Rome and martyred; (2) the Patriarchate of Alexandria and All Africa, which was founded by Mark the Evangelist, and which in antiquity played a highly important role; (3) the Catholic Patriarchate of Armenia, founded by the Apostle Andrew. Together, the three branches have a total of about 84 million faithful. The separation from the West took place because they did not accept the interference of the Roman Emperor Marciano in doctrinal questions after the Council of Chalcedon. For this reason they were branded as Monophysites. But now, thanks to ecumenical dialogues both with the Roman Catholic Church and the Byzantine Orthodox, it has become clear that the faith they profess is not monophysite but miaphysite, which means that in the Incarnation the human nature and divine nature in Jesus Christ were indissolubly joined in one person, and that Jesus Christ is “God with Us,” truly and fully God and truly and fully human. They recognize as “ecumenical” only the first three Councils because after that two of the three ancient patriarchates were absent from the councils and consequently the criterion for being an “Ecumenical” Council was not met. According to the Oriental Orthodox understanding, on being separated from the Christianity recognized by the Roman Emperor, the latter comprised only what they considered as the “West,” which, beginning with the great schism of 1054, was to be divided into the Byzantine Orthodox, the see of whose primate is in Constantinople, and the Roman Catholic, whose primate see is in Rome. During the period between the Council of Chalcedon and 1054, the Eastern Roman Empire established Greek Byzantine patriarchates in Antioch and Alexandria as rivals to the Oriental Orthodox Patriarchs there, although numerically without much success. After the great schism and the attempts at reunification with Byzantine Orthodoxy, Rome also has also established Greek Catholic patriarchates in these ancient patriarchal sees. In general the Oriental Orthodox churches use the oldest liturgies. For example, the Patriarchate of Antioch uses Syrian as its primary language, which developed from the Aramaic, which Jesus spoke. In addition, the liturgy that they use is basically the Syrian which comes from the liturgy that the tradition ascribes to St. James, brother of the Lord and first bishop of Jerusalem. The meeting took place in an atmosphere of great cordiality. The Oriental Orthodox clergy extended great courtesies to our bishop. At the end of the visit, it was decided to continue to deepen the dialogue. 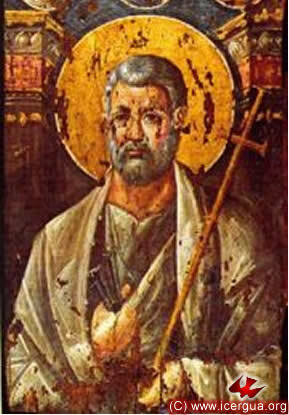 Above: Icon of the Apostle Peter, Bishop of Antioch from A.D. 37 to 67. Left: Deacon St. Ephrem, one of the most venerated fathers of Oriental Orthodoxy. 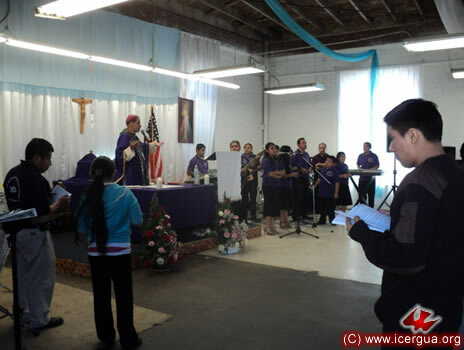 On Saturday afternoon, April 9, the Eucharist celebration of the see of the San Miguel Arcángel Parish, Los Angeles, had a special meaning. Brother Victor, secretary of the pastoral council and one of the founders of the community, was married. This special event filled all the participants with great joy. The entire celebration vibrated with a special spirit of gladness and hope. As part of the organizational development of the parish, on Saturday some young men and women served as acolytes for the first time. There is still some distance to go before everything will run smoothly, but a process has begun that with God’s help will reach that goal. The moment following the exchange of consent between the couple was the special place in the celebration of marriage for the invocation of the Holy Spirit, so that by His presence the union of man and woman may become an authentic sacrament of communion, like that of Christ with his church. Left: The bishop and all the community praying that the Holy Spirit may descend upon the couple that has shown its commitment to love and respect one another all their lives. 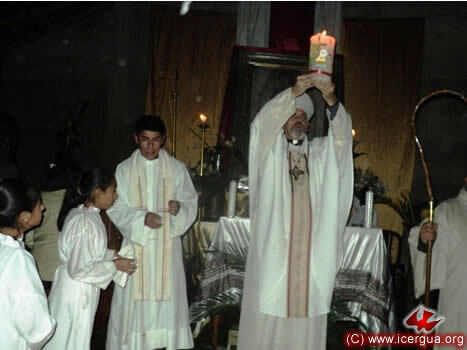 Right: With a simple censer that the faithful had brought from Guatemala, the bishop incenses the offerings. 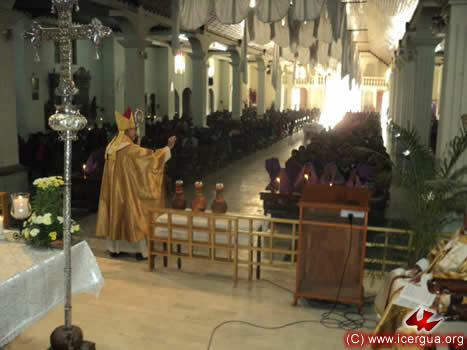 In late afternoon, the bishop presided at the celebration of the Eucharist with the Pacto Divino Community. It was a beautiful ceremony that again encouraged the faithful to keep firm in their commitment to live the Gospel and to witness it to all the world. 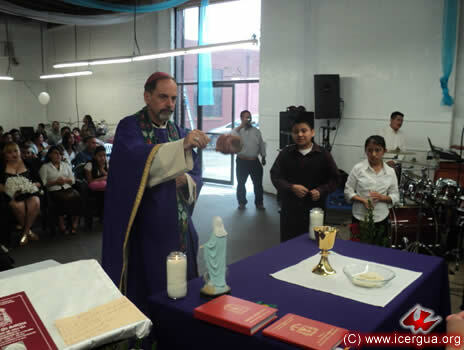 Left: Brother Danilo, the coordinator of the ministry, during the first reading. 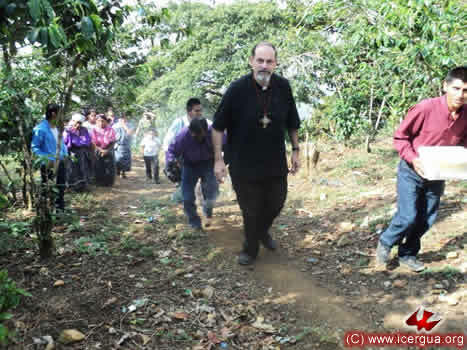 In the evening of April 9, the bishop visited for the third time the Voz de Restauración Community. This time, the visit had a special feature: Eucharist was celebrated for the first time and the Reserve of the Most Holy Sacrament was left with them. 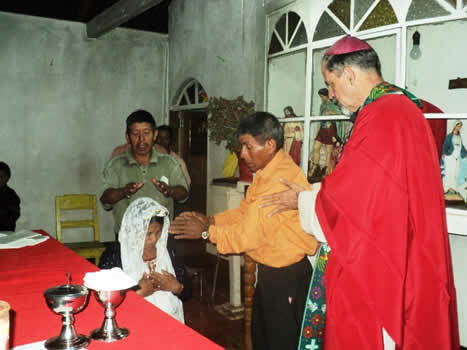 One of the leaders of the community, brother Pedro, has been a Communion Minister for some years. Now and in the future he will be able to exercise this ministry for the benefit of the People of God. Above: One of the sisters who coordinate the Community, doing the second reading. Right: The bishop presenting the bread and wine before the people receive communion. Sunday morning, April 10, was for the classes in the courses “The Synoptic Gospels” and “Christology.” The number of the faithful who are coming to these classes has increased recently. We hope that they will stay in the courses so that with their deeper knowledge they will be able to live with greater depth and give witness to the Gospel with clarity and strength. In the course on the Synoptics the bishop explained the sources that were used in forming each of the three synoptic gospels as well as the process followed by each evangelist in addressing his specific audience, which explains the differences among the different narratives. In the Christology course, the themes were Palestine in Jesus’s day, the various groups in Palestine, and the social configuration of these groups. As the photograph illustrates, the students followed the instruction carefully and attentively. 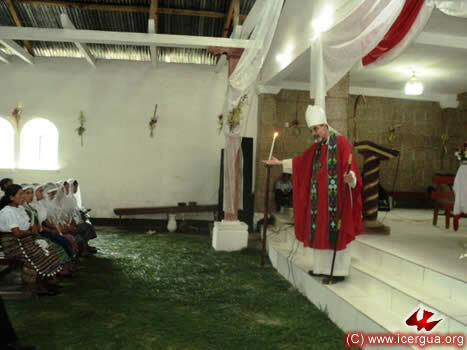 On Sunday afternoon, April 10, the bishop presided at the Eucharistic celebration with the participants at DETYM and a large number of parishioners in the El Pescador ministry. Although it did not have the solemnity of the celebration on Saturday, the faithful took great pains in preparing and participating in the celebration. Brother Ramón and León, the Communion Ministers in the El Pescador Community, presenting the Eucharistic offerings. 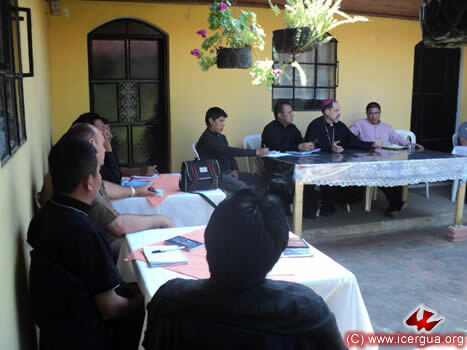 On Thursday, April 14, the regular meeting of the ICERGUA Presbytery took place in the Presbyters House of the Cathedral of San Juan Comalapa. 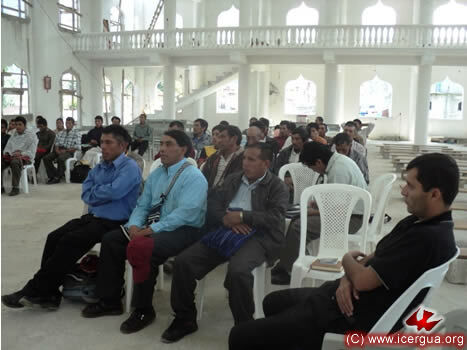 All the presbyters who are working in Guatemala were present. The meeting began with lunch and ended with the Solemn Celebration of the Chrismal Mass and renewal of presbyterial commitments. Deep brotherhood pervaded the atmosphere of the meeting. Fathers Rigoberto and Francisco, who are responsible for pastoral care in the Cathedral Parish, took great pains so that the Presbytery would receive a warm welcome. The meeting began with a brief report from each presbyter of the successes and difficulties that are being experienced. Two themes had special relevance: the bishop gave an update on the ecumenical dialogues that are aimed at deepening ecclesial communion. 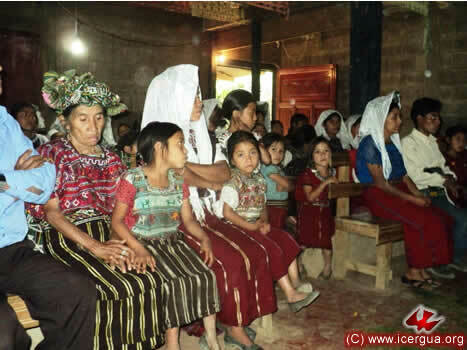 The other theme was the position of ICERGUA vis-à-vis the referenda that are taking place in different areas and the coming elections in Guatemala. In the end, certain basic guidelines were approved that our bishop, after consulting with representatives of the communities at the various deanery meetings, will make into a Pastoral Letter. At 4:00pm the Chrismal Mass began. 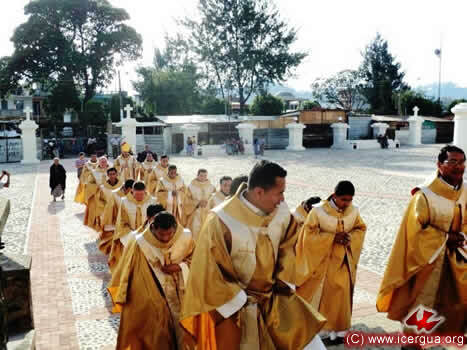 All the presbyters went to the Colonial Church to put on their vestments for the Eucharist and then processed to the Cathedral across the beautiful Plaza of San Juan Bautista, which was recently inaugurated. The photograph at left shows both the procession and the large, handsome plaza, which will be completed when a two-meter bronze statue is installed on the day of the Feast of St. John the Baptist. The statue will be on the pedestal half of which can be seen at the extreme right of the photograph at left. 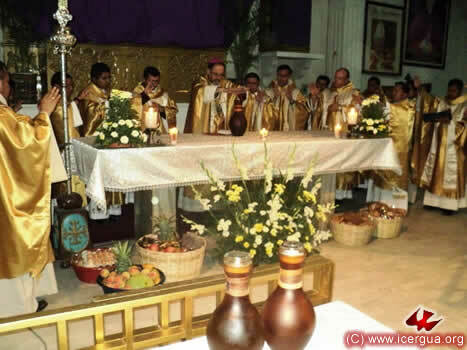 After the homily, Fathers Juan Moisés, Santos and Marcos processed with the amphoras containing the oil that was to be blessed or consecrated, depending on their destined use. Right: the bishop about to receive the amphoras from the presbyters. The bishop’s homily dwelt on Christ’s ministry, entrusted to bishops and presbyters. He emphasized that through the ordained ministry the salvation that Christ brought to humanity stays alive. In the name of the Lord, the bishop expressed gratitude for the presbyters’ unstinting devotion and dedication, who, in the midst of difficulties, extreme limitations and in many cases even persecution, made the effort to carry out their ministry faithfully. After the homily, the presbytery and the bishop renewed their ministerial commitments. After that, in accord with I Timothy 4:14 (“Do not neglect the spiritual endowment you possess, which was given you, under the guidance of prophecy, through the laying on of the hands of the elders as a body”), the presbytery prayed over the bishop, who was kneeling (photograph at right). Then the bishop and the People of God prayed for each of the presbyters, imploring the Lord to kindle His grace in them anew and give them a holy life that they may be able to witness to the presence of the Kingdom in the midst of the world. Near the end of the celebration there took place, first, the blessing of oil of catechumens, which will be used to anoint those who are baptized and the hands of those who are to be ordained presbyters. 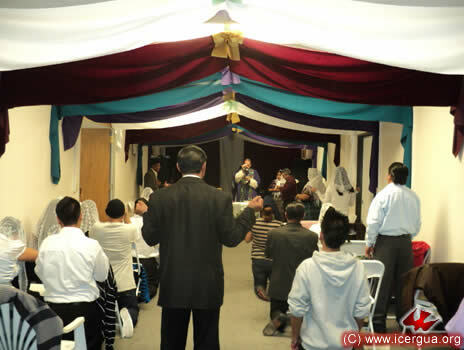 Then, as can be seen in the photograph at right, prayer was made that the Holy Spirit might consecrate the Holy Chrism. The Holy Chrism is one of the most powerful symbols of the outpouring of the Holy Spirit. It is used to anoint chrismally those who have been baptized, imploring the outpouring of the Holy Spirit upon them. It is also used for the consecration of a bishop, who is anointed on his head and hands. In the ancient tradition, the Holy Chrism also symbolizes the presence of the Spirit who keeps and guarantees the sacramental unity of the visible church. For that reason it is consecrated by the Holy Synod of bishops, presided over by a patriarch. Finally, as can be seen in the photograph at left, the bishop with the entire presbytery impart the solemn blessing on the People of God who had participated in the celebration. When the celebration ended, night had already fallen. The recession went to the Colonial Church. In the photograph at right the Presbytery is posing against the background of the impressive Colonial Church, beautifully illuminated. 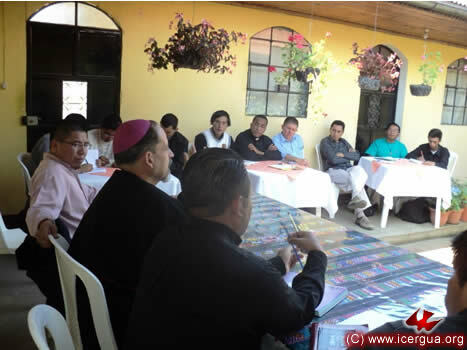 On Friday, April 15, the bishop presided at the meeting of the Nebaj Deanery, at which participated about thirty delegates from the various communities and Father Marco Tulio Calderón Mira, who is responsible for the pastoral care in this area. Each community reported its progress. Ways to make the pastoral work more efficient and help the communities better reflect our identity were discussed. 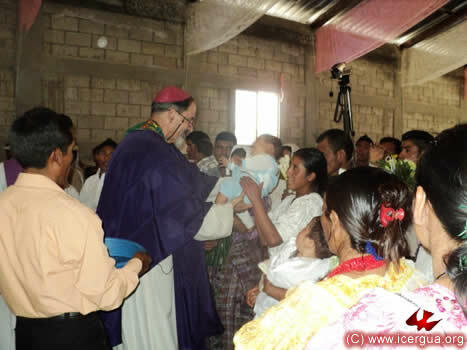 In the afternoon the bishop visited the Uchuch Community in Nebaj. 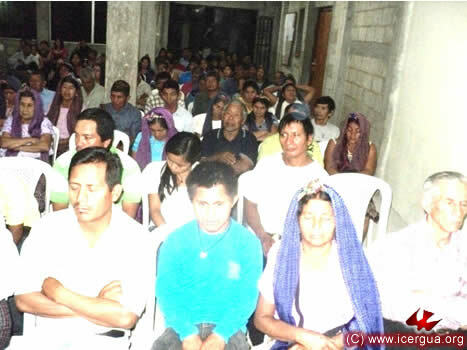 Located in the western part of the municipality, it is determined to evangelize all the members of the village with greater efficacy. In the evening the bishop presided at the Eucharist with the directors of Channel 15. 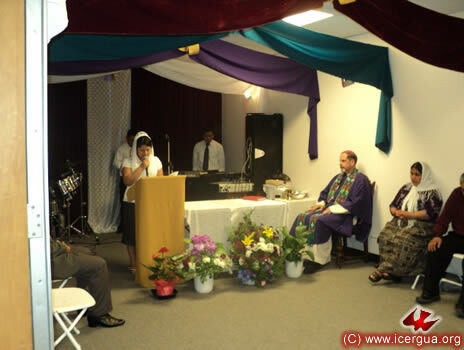 Most of the personnel of the station are members of the Church, and although it is not officially a part of the Church, it maintains a cordial relation with us and on occasion broadcasts events taking place in the Church. 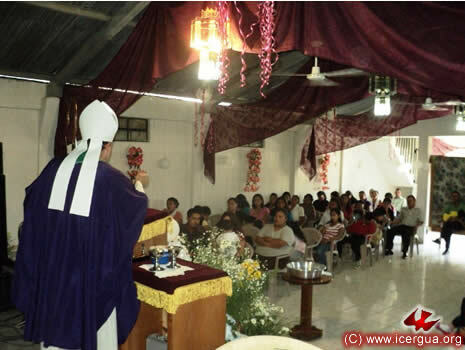 On Saturday, April 16, the bishop presided at the Chajul Deanery at the seat of the Chel Parish. 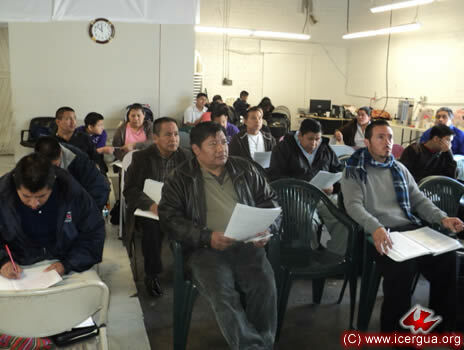 About forty-five delegates from the various communities attended. The representatives shared the way in which they were working and also the sustained growth that they are experiencing. 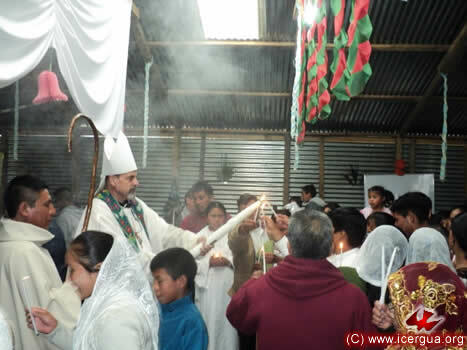 On the afternoon the April 16, the bishop arrived at the remote community of Satziván. Located high in mountains that are part of the Cuchumatanes, it is accessible only by a difficult road. The community has succeeded in acquiring a piece of land on which very soon construction of a church building will begin. At the present the faithful meet in the basement of the house of one of their members. Many families have been added to the community in recent months. Above: The bishop delivering the homily to the Assembly. Right: Some of the participants at the Eucharistic celebration. 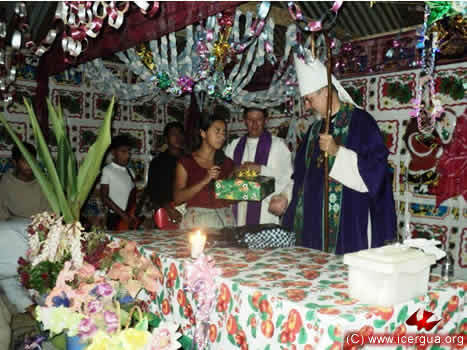 At dusk, the bishop visited the La Perla Community, located on the plantation of the same name. The young people showed their joy for the visit and for the pastoral work of Father Marco Tulio by presenting a gift to the bishop, as can be seen in the photograph at left. 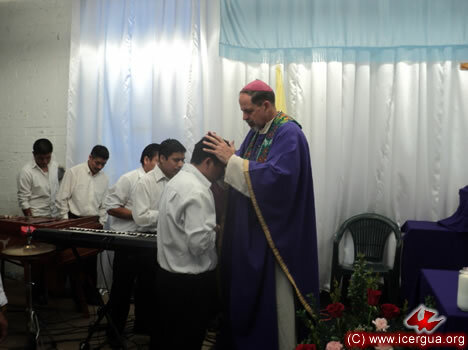 On Palm Sunday, April 17, the bishop began his pastoral activity in the Salquilito Community, in the center of Nebaj. 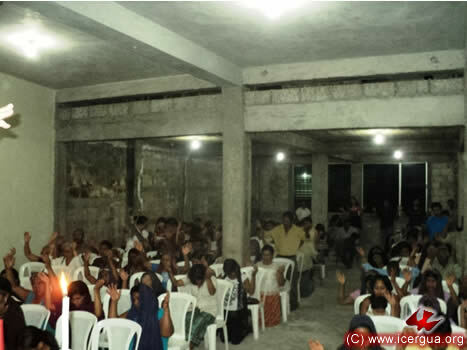 About four months ago the community began the construction of a spacious church. They have put up the walls, the roof, and part of the presbytery. 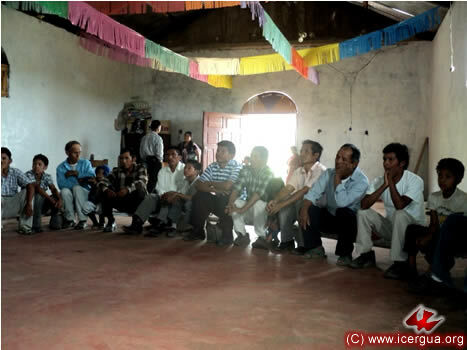 Because of the community leaders’ commitment, the community has been blessed with steady growth and is making a missionary power point projection to help in establishing new communities in the villages of the municipality of Nebaj. Although there is much to be done to complete construction, a good part has been accomplished. 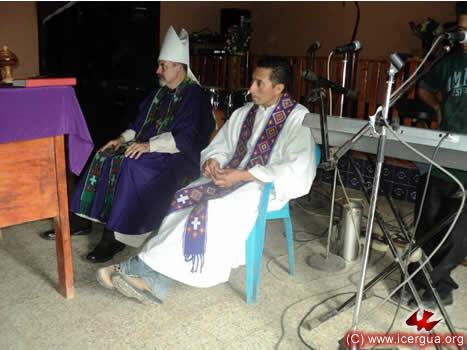 In the photograph at left: Father Marco Tulio and Seminarians Jeremías and Eduardo, who during Holy Week did pastoral work in the Nebaj communities. 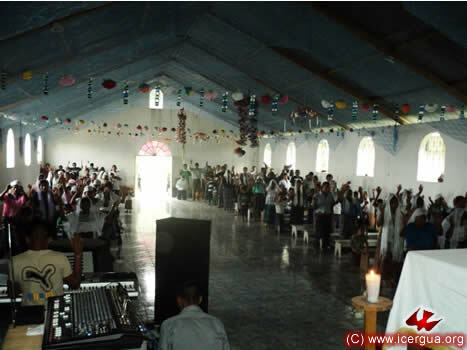 On the afternoon of April 17, the Santísima Trinidad, Uspantán, Parish celebrated its Assembly. Representatives of the various communities came for an instructive address by the bishop. 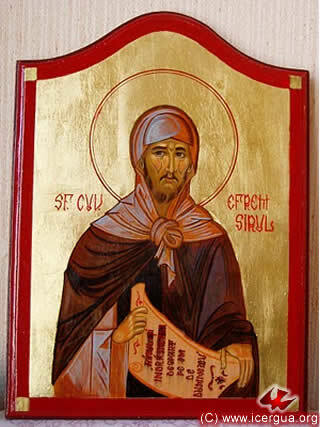 His theme was the characteristics of the early church communities, which ought to be the same that our communities have. He exhorted those present to work with renewed enthusiasm in the organization of the communities and in missionary action. The Assembly ended with a celebration of the Eucharist. 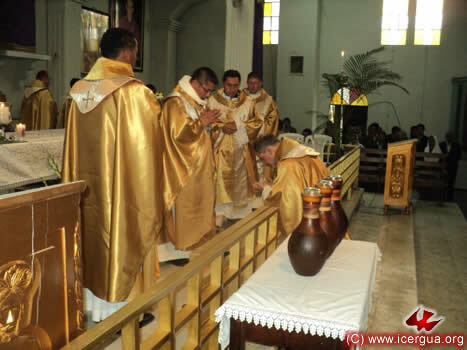 During it, the receiving of chrism was confirmed for a group of young people, well prepared by Father Denis Obando, charged with the pastoral work in the community. They committed themselves to help strengthen the parish’s liturgical and pastoral team. 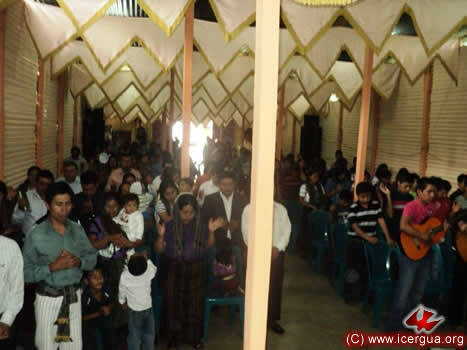 Left: After the confirmation ceremony ended, the parents and sponsors of the young people prayed over them, imploring the Lord’s grace to be faithful in their mission promise. 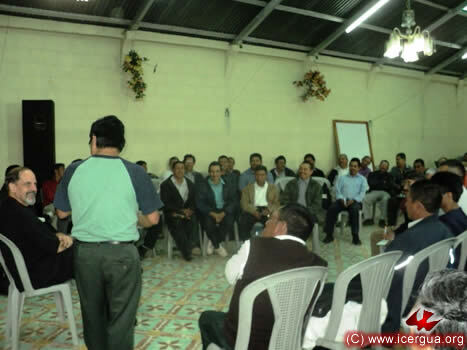 In the evening, in the presence of about thirty delegates from the Uspantán Parish and seven representatives from the Pastoral Center at Chamá Grande, Cobán, Alta Verapaz, the meeting of the Deanery of this area took place. The faithful discussed many questions, and after a long dialogue they agreed on the fundamental bases for pastoral action. Above and left: The bishop explaining to the faithful the characteristics of the mission work that is taking place. Much attention was given to claims of having the gift of prophecy. Criteria were presented for discerning the authenticity of this gift; these criteria are wholly based on Holy Scripture and protect the life of the communities from being confused by supposed revelations that do not have a firm basis in the witness of Holy Scripture. 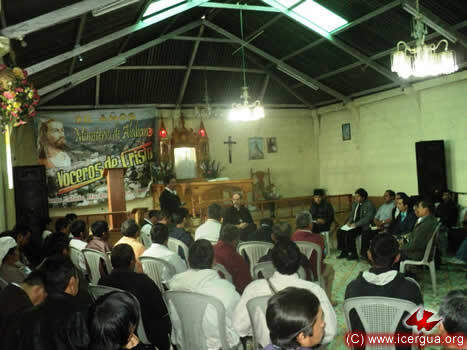 On Monday morning, April 18, with about thirty-five delegates, the Deanery of Cunén and Sacapulas, El Quiché, had its meeting. 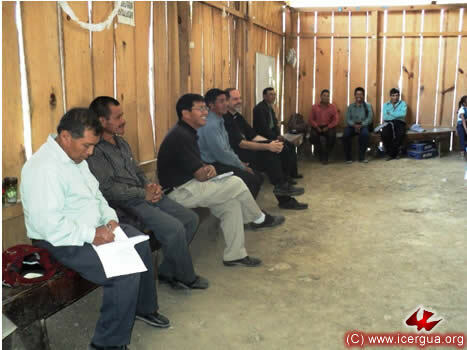 The work that has been carried out up to the present was evaluated, new strategies for pastoral action came forward, particularly for the center of the town of Cunén , and zeal for missionary action in all the communities was encouraged. 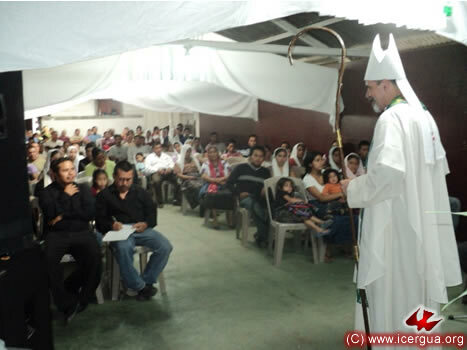 During the afternoon of April 18, the bishop presided at the Eucharist in the Cecilia, Cunén, Community. 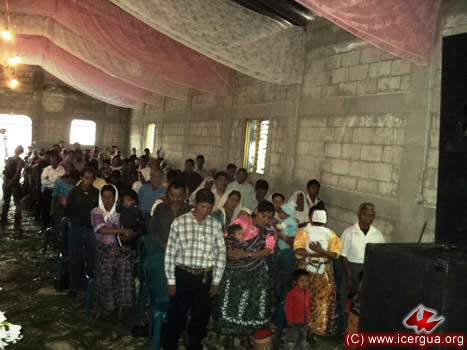 The faithful have built a spacious church, capable of holding about five hundred people. Construction continues, though the building is far enough along that it can already be used for the meetings and prayers of the community. On this visit, the bishop was accompanied by Father Bernabé, who is responsible for the pastoral work in Cunén and Sacapulas. 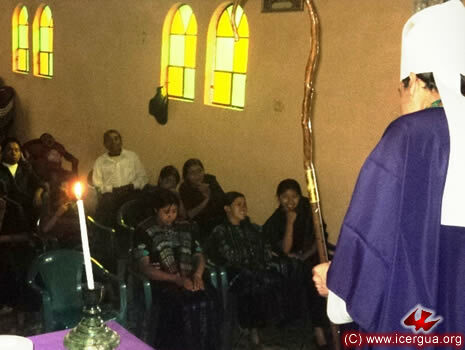 During the celebration several children were initiated into Christian Life. 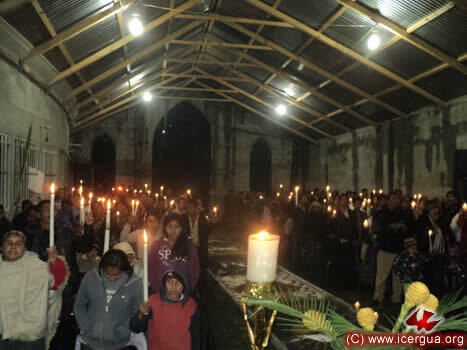 Toward dusk on April 18, the bishop celebrated Eucharist with the Paraxtut, Sacapulas, Community. 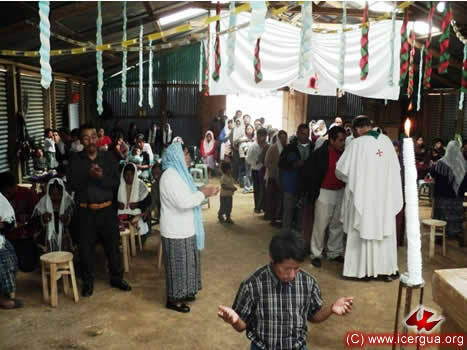 The faithful are very enthusiastic and, like the other communities in the municipality, reiterated their commitment to continue working to form new communities so that one day, in the near future, they can become a parish. 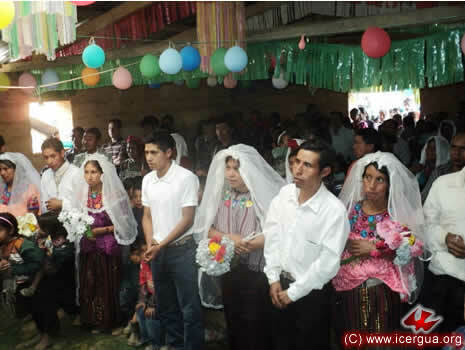 The celebration provided the opportunity for a young couple to contract matrimony. Right: The newly weds, during the giving of rings and bridal coins. 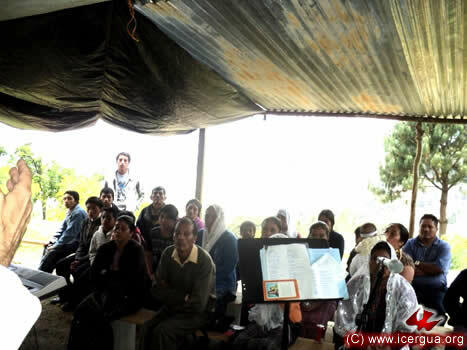 On Tuesday, April 19, the meeting of the Deanery of West Huehuetenango, which includes the Poptí area and the Huistas, took place in Jacaltenango. 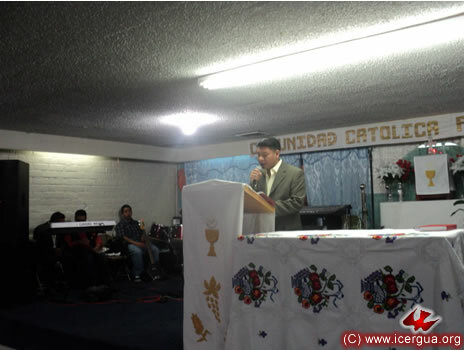 Left: Brother Benito, from Onlaj, is presenting to the Assembly the request that the Communities of Concepción Huista be established as a Renewed Catholic parish with the name, “Santa María del Nuevo Éxodo.” The request was accompanied with documentation pertaining to their fulfillment of the requirements set forth in the Church’s Constitution. Everything being in order, the request was approved, and it was decided that the formal act of establishment will take place at the next meeting of the Deanery. The theme for the bishop’s remarks was the question of the attitude of our Church vis-à-vis the referenda and elections. These communities have suffered profoundly in recent years because of religious leaders of other denominations who have tried to manipulate the People of God in order to serve their own interests. After the bishop’s presentation and dialogue, the Assembly concluded that the bishop would summarize and address these concerns in a Pastoral Letter. 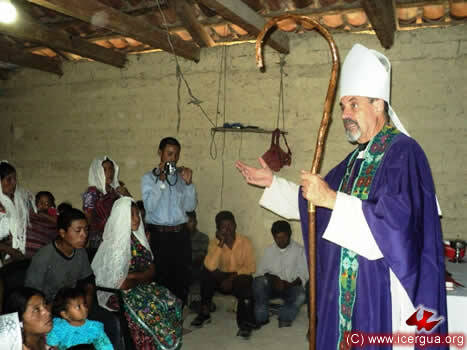 On the afternoon of April 19, the bishop, accompanied by Father Santos, who is charged with pastoral care for this area, celebrated Eucharist with the faithful of the Petatán, Concepción Huista, Community. Above and right: The Eucharistic celebration. 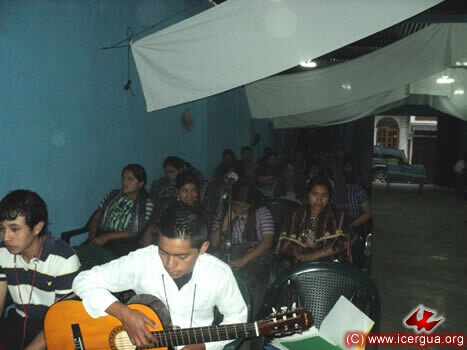 During the evening of April 19, Monsignor Eduardo presided at the Eucharistic celebration with the community of Central Jacaltenango. By the grace of God, this community has grown remarkably. Just three years ago, the community was reduced to only a few members. Now there are several hundred faithful who assiduously participate in the life of the community. 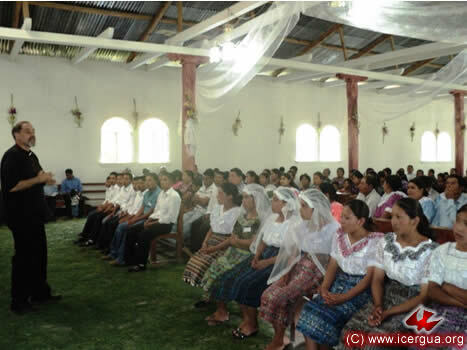 Like the communities of Concepción Huista, the communities of Jacaltenango are at present in the process of organizing themselves in order to request that they be established as a Renewed Catholic parish. APRIL 20. DEANERY OF NENTÓN AND EUCHARIST IN K’ANK’INTIQ AND SUBAJASUB, NENTÓN, HUEHUE. 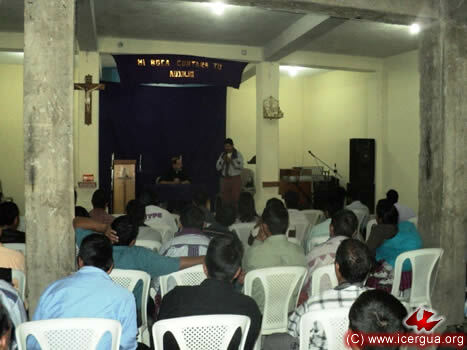 On Wednesday, April 20, the Deanery of the Nentón, Huehuetenango, communities took place. 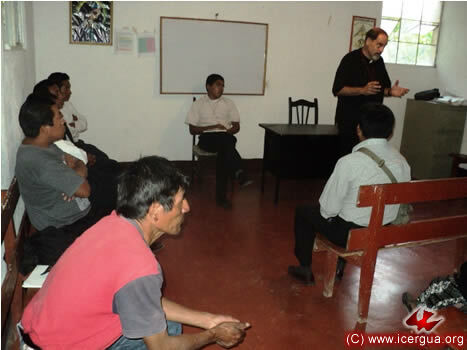 Julian Bal, the bishop’s delegate for the Nentón communities, has been working with them for the past ten months. Thanks to this work, numerous obstacles have been overcome, and the unity and identity of the communities has been consolidated. At present they are preparing to carry out a promise to do systematic missionary work. About thirty representatives of the various communities participated in the meeting. In all of them, the hope and desire to be actively committed prevailed. At the end of the Deanery meeting, Eucharist was celebrated with the delegates and some members of the K’ank’intiq Community. Above: The faithful after confessing their sins come forward to receive Absolution. Right: During the homily, the bishop explained some aspects of the passion and death of the Lord and, as a result of the salvation that we have received, the missionary commitment that we are called to carry out. 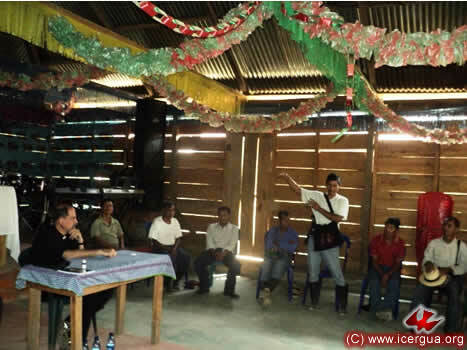 In the afternoon, a celebration took place in the Subajasub Community, also in the municipality of Nentón. In view of the constant growth that the community is experiencing, the faithful have enlarged their house of prayer. At the end of the celebration, two young men and one young woman, having shown signs of turning their hearts to the Lord and the desire to join the community, were admitted as members. The prayer was that the Lord might give them an authentic spirit of conversion and that they might be able to persevere on the road of faith. 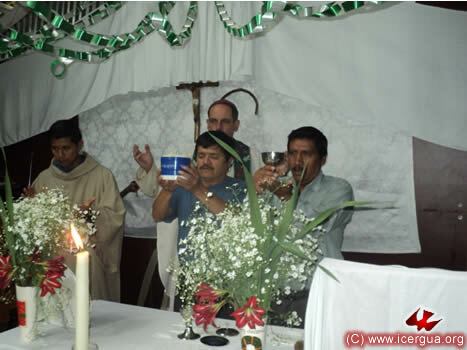 On Maundy Thursday, April 21, the deanery of Barillas and San Mateo Ixtatán took place, about a hundred faithful participating. 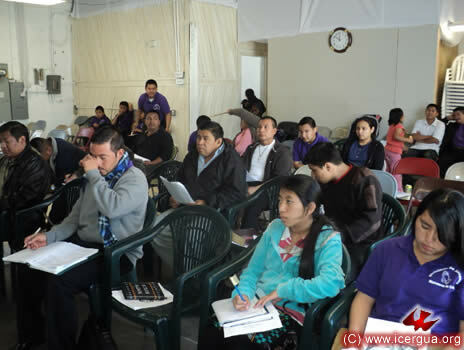 The delegates from San Mateo and the five groups functioning in Barillas made brief reports on the pastoral progress of their respective communities. 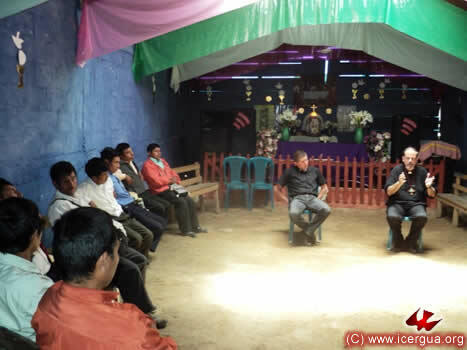 Then the three presbyters who work in this area—Fathers Hugo, Marcos and José Armando—presented their judgments. 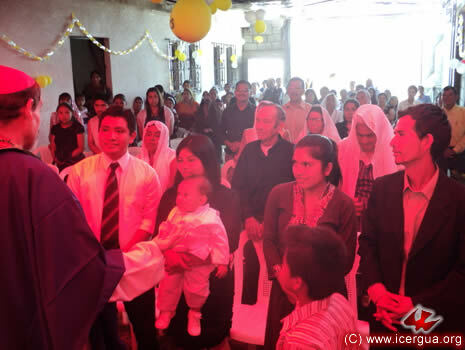 At the end the bishop reported on the progress of the Church and entered into a dialogue with the delegates concerning the Pastoral Letter that will be published in the near future. One of the remarkable things in this regard is the progress made on the construction work on the beautiful parish church for the Parish of La Glorificación de Santa María de Barillas. In the photograph above as well as in the one at right, one can see this progress. In addition, at right, one sees a delegate reporting on the progress in his group. During the afternoon of April 21, the bishop visited the Capilla San Ramón Community in the municipality of Santa Cruz Barillas. The faithful had taken pains to take care of all the details. In addition to the church, they have constructed a large pastoral house and paved the main road leading to the church. 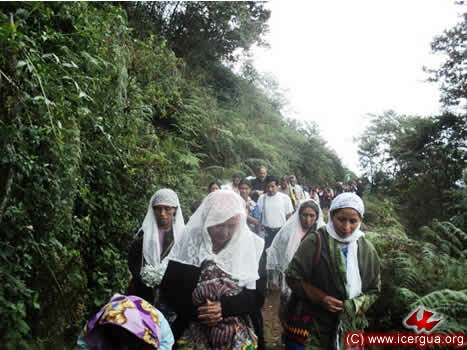 Many sisters went out to receive the bishop at the highway with incense, flowers and, above all, great affection. During the celebration of the Eucharist, the prior receiving of chrism was confirmed for a well-prepared group. Above: The faithful welcoming the bishop. Right: The celebration of reconciliation before celebrating the Eucharist. 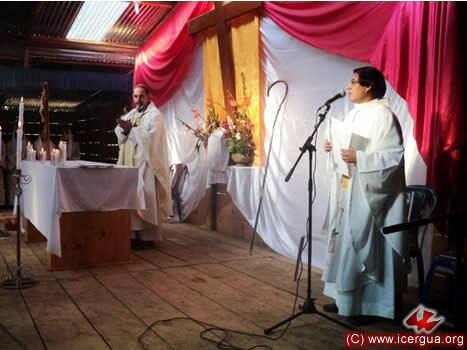 On Friday, April 22, commemorating the passion of our Lord Jesus Christ, Monsignor Eduardo visited the Victoria Amelco Community, located in the southern part of the municipality of Barillas. The faithful went to greet him at the highway and made the short walk from there to the house of prayer. 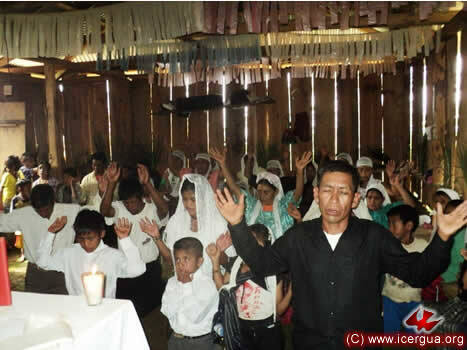 During the celebration, owing to pastoral urgencies, some children were initiated into Christian Life (right). 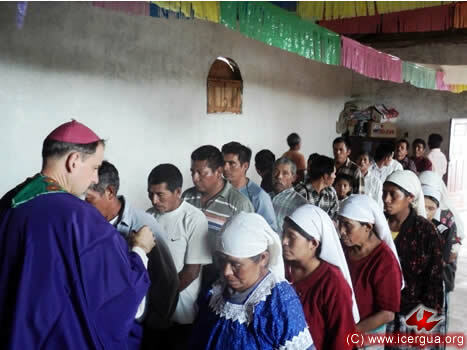 During the afternoon of April 22, the bishop visited the community of Huilatizú in the southwest of the Barillas municipality. Hundreds of the faithful came to greet the bishop. The first ones arrived with vehicles at the edge of the village. The rest were waiting at the highway and from there made a procession from the highway to the church. In the photograph at left, one sees the journey, about five hundred meters long. The visit was the opportunity for a sister, who had been appropriately prepared, to be installed as Communion Minister. Her mission will concentrate mainly in service to the ill.
On Saturday morning, April 23, the meeting of the Deanery that includes the municipalities of Santa Eulalia, Soloma, San Rafael, San Miguel and San Sebastián took place with the participation of eighty delegates. A representative of each of the central pastorals recounted the experience of recent months. At the end, Fathers Fredi and Luís Felipe also shared their experiences and pastoral projects. Then the bishop reported on the progress of the Church and agreed with the delegates’ consensus concerning aspects that will be included in the next Pastoral Letter. 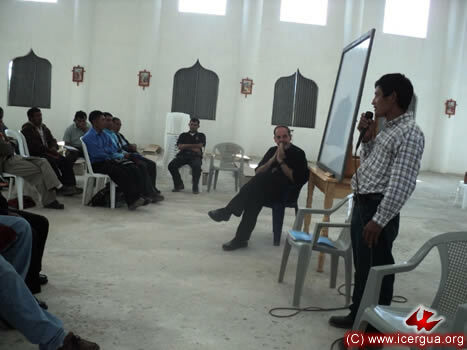 Above: Brother Marcos of San Miguel Acatán explaining the situation of the communities of that municipality. Left: Father Fredi making his report. At his left is Father Luís Felipe. 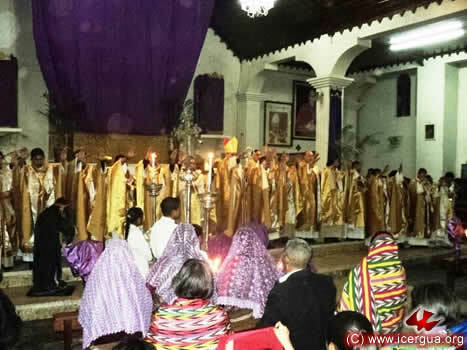 During the afternoon of Holy Saturday, the bishop began the Easter celebration with the Vigil in Jolomcú of San Rafael La Independencia. The faithful participated actively and promised to live the Easter experience, particularly in working vigorously in the Church’s mission. Above: The bishop presenting the paschal candle to the People of God, from which they lit their candles. Right: Some of the parishioners in line to receive Holy Communion. 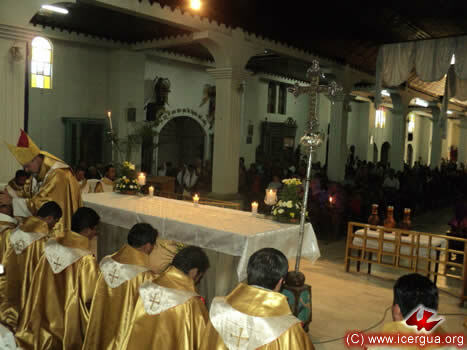 On the evening of April 23, Monsignor Eduardo presided at the solemn Easter Vigil in the Parish of Nuestra Señora de Guadalupe in Soloma. The preparations were abundant. 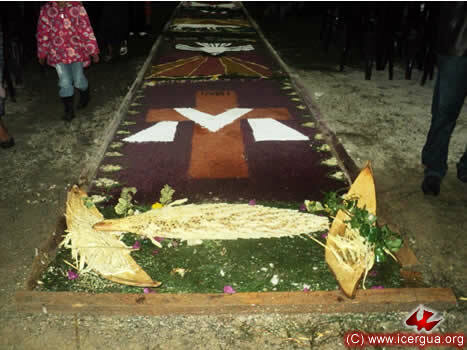 Among them, with the help of Seminarian José Raúl, who had been assigned to do pastoral work in this parish, was a beautiful carpet for the procession. 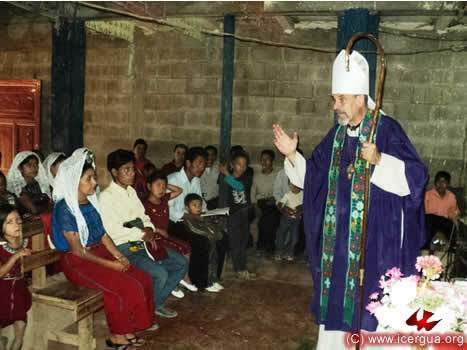 In addition, the bishop celebrated for the first time in the temporary church that has been built. In spite of the rain, the People of God gathered for the blessing of the fire, a symbol of Christ’s resurrection, that transformed the darkness into light. 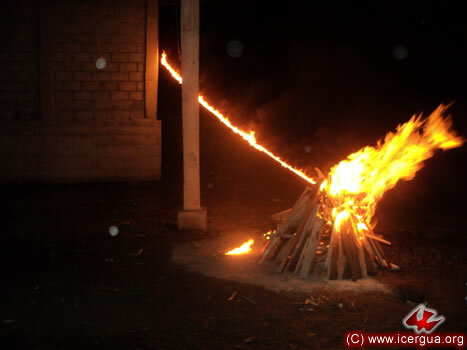 The lighting of the fire was prepared in such a way that it seemed as if fire were descending from on high. Upon arriving at the church, the bishop presented the paschal candle to the People of God, as can be seen in the photograph at left. 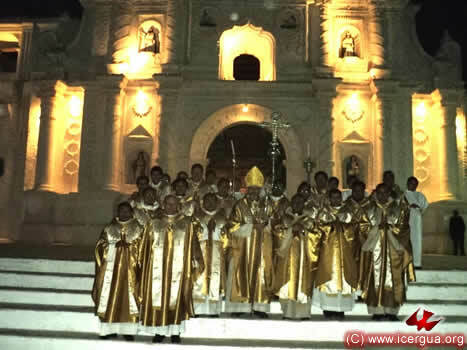 Then, Father Juan Moisés Mendoza intoned the song of the proclamation of Easter. 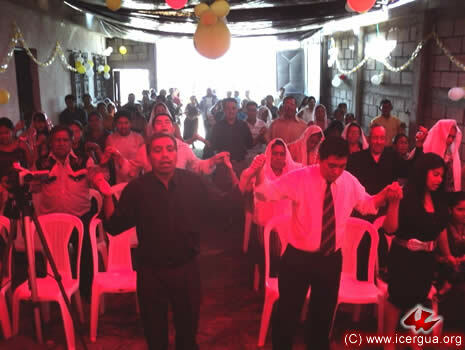 During the singing, the People of God jubilantly lit their candles and asked the Lord to illumine their lives with the light of the Holy Spirit. On Easter Sunday our bishop started his pastoral visits in the Renewed Catholic Parish of Santa Eulalia. For the first time he celebrated in a place that the faithful had only recently bought, planning to build its new parish church there. 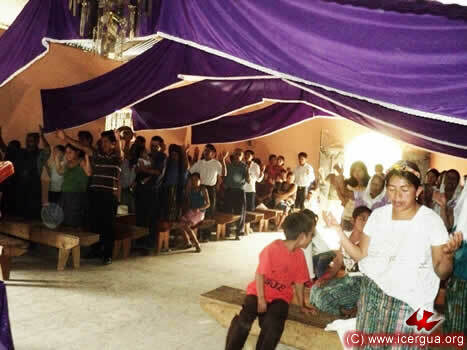 For the interim, the faithful have put up a huge house of prayer—600 square meters. The parish community is growing rapidly and the parish presbyter, Father Fredi Mux, is happy and grateful to the Lord for the many blessings that are being experienced. Above: Father Fredi Mux greets the bishop and makes special announcements at the beginning of the celebration. Right: Panoramic view of the house of prayer, quite full, in spite of its huge dimensions. To commemorate the resurrection of the Lord, twenty faithful received the sacraments of Christian Initiation. The presbyters had prepared them with care, and the ceremony unfolded in the midst of universal jubilation. 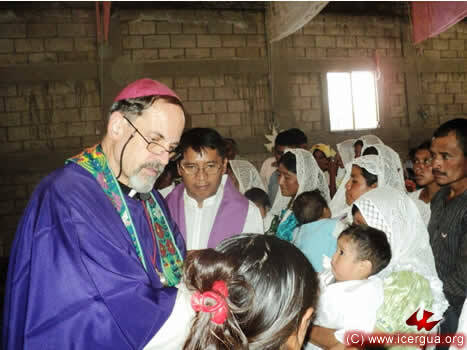 Around noon, the bishop paid his first pastoral visit to the nascent community of San Sebastián Coatán. The community has about forty members, who are not only very glad that finally they have established a community, but also are eager to work unstintingly for its growth. The community does not have a house of prayer, so the Eucharist celebration took place in the corridor of the house of one of the members. 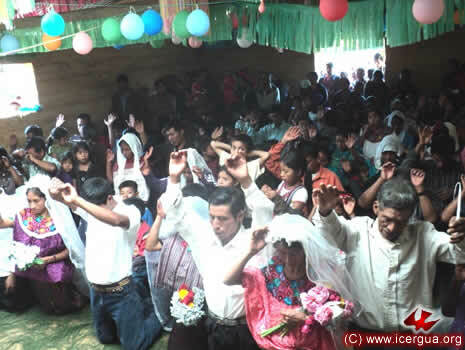 The faithful hope to be able in the near future to have the resources needed to buy a lot and build a church. 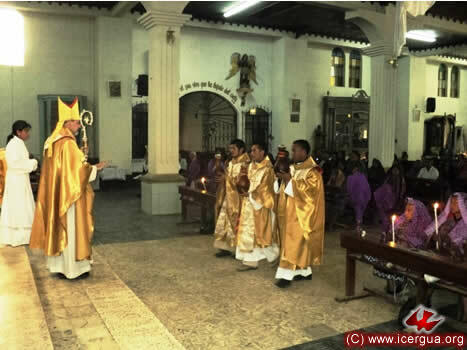 On the afternoon of April 24 in a completely filled church, the bishop celebrated with the central community of San Miguel Acatán. 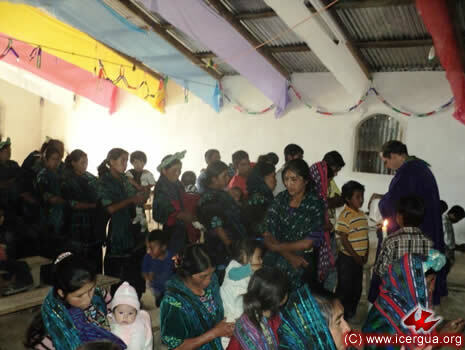 Sustained growth continues in the community, and in addition the faithful are carrying out plans to found more communities at places where there are not yet any. Above: The faithful listen to the bishop’s homily. Brother Diego, coordinator of the community and the person who will translate the homily into the Acateco language, is concentrating on taking notes. Right: The communion ministers present the offerings. At the left is Seminarian Arturo, who with this celebration completed his week of pastoral work in the San Miguel communities. 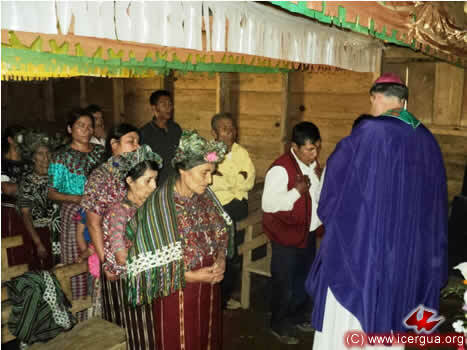 On Monday afternoon, April 25, the bishop visited the “Efusión del Espíritu Santo” Community of Santiago Atitlán, Sololá. 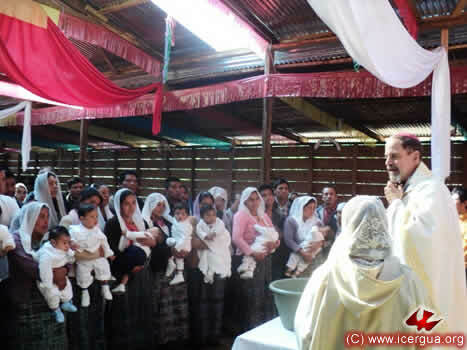 Several children were initiated into Christian Life. Right: The bishop doing the sprinkling of water, part of the baptismal rite. 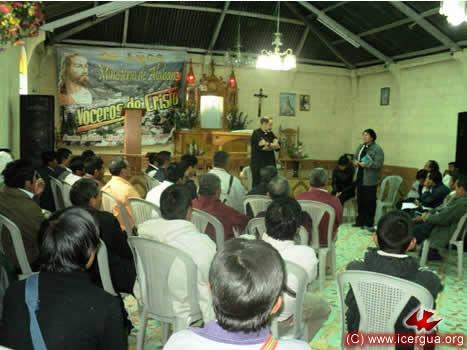 At dusk on April 25, Monsignor Eduardo visited the “Pentecostés” Community, also in Santiago Atitlán. Three children, duly prepared, completed their Christian Initiation, making their first confession and communion.